I believe there comes a time in everyone’s life when we get too busy. I love writing this blog but my other passions just got in the way. A good friend of mine Jeff Kralik, whom I met on Social Media, writes a wonderful blog. If you haven’t heard of or read his blog, I recommend it highly. It’s called The Drunken Cyclist. He recently wrote a blog about some of Passaggio Wines. I was truly humbled and fascinated by his tasting notes. After reading Jeff’s blog about Passaggio, it inspired me to start this blog back up again. (although I will never write as well as Jeff) I went to the wine cellar and pulled out a rosé I just purchased at Sonoma’s Best, a great little deli, wine shop, near the Sonoma Square. The Women for Wine Sense, a great national organization, have their annual rosé tasting there. What a great time we had sipping on several different Rosés. If you have never heard of Women for Wine Sense, here’s the link to their site. Anyway, back to the rosé. This was one of my favorites of that evening at Sonoma’s Best. 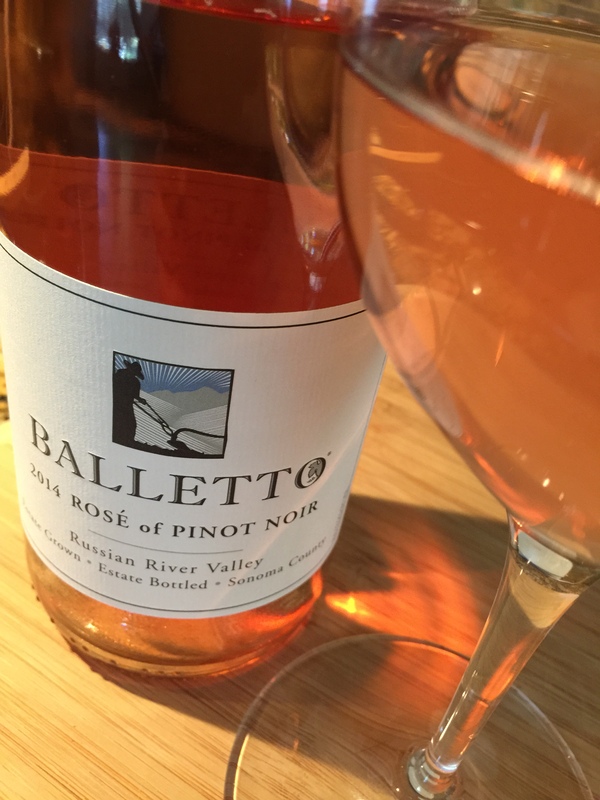 The Balletto 2014 Rosé of Pinot Noir. I found out an interesting fact about this wine the night of the tasting. This wine is a blend of 75% whole cluster press and 25% of the “bleed off” of their regular Pinot Noir fermentation. This wine was very complex. It had layers of strawberry, cherry, and citrus. A great minerality on the nose and a balanced acidity on the palate. A great wine for just sipping on the patio. Stainless steel fermented. ABV 13.2%. Thanks for the very nice shout out, but more importantly, good to see you back at the keyboard!